The first female officer of color ever hired by New Jersey's Neptune Township Police Department has officially resigned, saying she could no longer take the stress of an atmosphere she called "the good ol' boys club." Melissa Russo reports. The first female officer of color ever hired by New Jersey's Neptune Township Police Department has officially resigned, saying she could no longer take the stress of an atmosphere she called "the good ol' boys club." "I've been harassed. I've been sexually discriminated against. I've been retaliated against," Elena Gonzalez, an 11-year veteran of the force, told NBC 4 New York's I-Team in an exclusive interview. Gonzalez and another female officer, Christine Savage, claimed in parallel lawsuits filed in 2013 that they were subjected to repeated offensive comments, denied training for advancement and promotions, and punished for requesting equal treatment. "These are the types of things that happened 30 to 40 years ago and people recognized it was wrong," said Donald Burke, an attorney representing the women. Burke's son, Jr., is also part of the women's legal team. The township has denied all of the allegations, but hired an independent investigator, Gregory Turner, to conduct a review. Turner finished the review in late 2013 but the township, saying the report includes personal employee details, will not release the results. Donald Burke Jr. says that's not acceptable. "If they’re going to hire an impartial investigator to investigate what our clients claim has been going on, let us know what the results of the investigation are," he said. "Let us know what you’re doing about it to make sure it never happens again to anyone else." With the report under wraps, the township, admitting no wrongdoing, settled with the two officers for $330,000 each in 2014. They were both promoted to sergeant, making them the only women in senior positions in the department. Neptune Township has a total of 70 officers; five are women, 22 are people of color. Both Gonzalez and Savage claimed the abuse continued after their promotions and filed new lawsuits in 2016. Ultimately, Gonzalez resigned. She said she was on the brink of a breakdown and had to make what she described as the toughest decision of her life. 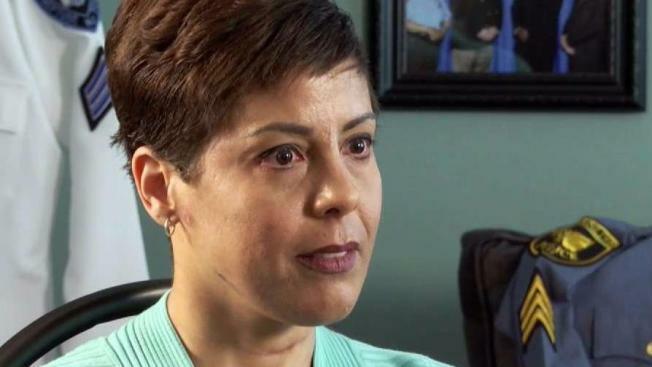 "I deteriorated so badly that my health was put at risk," Gonzalez said. "There was nearly daily harassment." At a public meeting on April 25, Gonzalez read her resignation letter aloud to township officials. Savage, who is prohibited from speaking on the matter publicly under township policy, stood by her side. "Despite my many complaints, there was never any investigation into the unlawful conduct, let alone efforts to stop it," Gonzalez said. Gonzalez, an adjunct professor of criminal justice at Rutgers and a single mother of a daughter in college, said she doesn’t know what her future will be bring, but she is prepared for a legal fight. "I have integrity and I am not going to let them take my integrity away from me," she said. "Any female or minority coming into the department is going to face the same thing that I faced." The lawsuits she and Savage filed last year are ongoing. Savage still works for the department. The township said it is not permitted to speak about the specifics of Gonzalez’ accusations, nor is it allowed to comment on any disciplinary matters that may or may not be pending against her.